After the Hand Me Down distribution in August, it was back to business as usual, with a purpose though! Our next Hand Me Down was to be 12th October, and the donations were rolling in. Much time has been spent behind the scenes, sorting and packing the donated clothes. Last minute donations had come in and the dedicated volunteers work late into the night to sort and pack the clothes. It is a labour of love, done with a good heart and great excitement. Friday dawns with pouring rain, which does not dampen our spirits, we know we are on a mission and will not be swayed. Together with our core team we have three new guest volunteers. This distribution is very special as it is Matilda’s inaugural trip! Matilda is Hand Me Down’s latest team member, a beautifully resorted Landy 110! 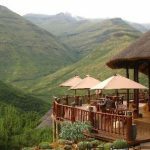 We arrive at Maliba Mountain Lodge just before 8.00 pm with the last hour or so driving in the dark. Our new volunteers have no idea of the scenery around us. Tomorrow will reveal the beauty of Lesotho. Besides the natural beauty there are the wonderful people of Lesotho who have won our hearts. Our distribution is to a remote Community called Masianokeng, meaning “the village across the river”. Besides the Hand Me Down Volunteers, we are joined by Chris, Nicola, Daniel (our guide) who are from Maliba Mountain Lodge, Maggie and two Community Workers! We have 5 Land Rovers filled to the brim with bags of donated clothes. We squash our guests into the back of the Landy’s, squeezed between all the clothes, and set off! The excitement builds the community we are going to is across the river and at a high altitude. The journey is just as much part of the adventure, as the actual distribution. We weave our way over the rocks of the river; fortunately the water level is fairly low at this time of the year, and then head to the mountains. As we approach the village we are greeted by shouts and cries of welcome. We are humbled by the response to our simply being there. The children are busting with excitement, but are well behaved. They are shy, quiet and reserved. They wait patiently for the village elders to tell them when they can come forward to receive clothes. Today our aim is to provide clothing for the 55 orphans of this community. We manage the task with ease and there is plenty left over for the other community members. The children’s eyes shine with excitement as their arms are filled with clothes and shoes. They show their friends what they have chosen and their smiles of delight say it all. The Health Care workers in the area come with us to facilitate the distribution together with the elders of the community. They have an understanding of the needs in the area, and have prepared lists of names in order of the greatest need. The workers are the ones who hand out the clothing to the children. At no time do we hand out clothing or assist, our reward is to see the looks of satisfaction on the faces of the care workers. It is a fulfilling day for them, and I believe it gives them hope and encouragement to continue with the good work that they do on a day to day basis. When we first arrive there is a reserved respect as everyone one waits for the order of events. A prayer of thanks is given, and the children are called up by name. Although time consuming it is an orderly process. Some of the orphans are heading up households for their siblings, even though they themselves are young children. They appreciate the fact that someone does care for them, and that people are willing to make an effort to bring clothes to them. We have found that by taking photographs and showing them to the children on the digital display, breaks down the barriers, and soon we share laughter and smiles. Some of the children speak English and will ask “shoot me, shoot me”, they are ready for a photo-shoot. Some children will shyly giggle, others will pose, and still others will remain emotionless. Each photo is special and deserves to be returned to their owner. I delight in making copies of the photos, and returning them. As is the way with Africa, there is a harsh reality; two months ago I took a photo of one of the elderly ladies from the Ma Hali Community. Sadly, she had passed away, and all we could do was leave a photo of her for her family as a remembrance. Another wonderful pastime is interacting with the children by way of a simple hand game. They thrive on the attention and thoroughly enjoy playing this simple memory game. The joy and laughter is infectious and long lasting. Although each distribution has a different dynamic we have found that team members come away with a sense of meeting that one special person. It happens every time we visit; someone will stand out to us. Not the same person, just someone in the crowd and they will have a marked effect of us. At the village of Masainokeng I met a delightful lady who was 72 years old. She spoke excellent English and asked to speak to someone who spoke Afrikaans! I was so touched by her. She had a conversation with one of our new volunteers and appeared to be reliving something of her past. She had a dreamy happy look on her face. Chris from Maliba Mountain Lodge said something to me that sums up the volunteers of Hand Me Down; he is inspired by two things, passion and do-ability. The volunteers of Hand Me Down have both those qualities. We are driven to reach more villages and communities with a simple donation of clothes. We are like minded, passionate and determined to make a difference to as many people as we can.